We are locally-owned, we want to help you make the right flooring and installation decisions for your home to ensure your total satisfaction for years to come. Serving the Dayton area since 1989! Individualized attention with one of the largest and most complete showrooms in the Dayton area is what you'll find at your locally-owned Carpet Consultants. Visit our 5,200 sq. ft. showroom to experience the latest and greatest in today's flooring selections, preferred brands, designer choices, and eclectic collections. Designs and brands you know are waiting for you at Carpet and Flooring Consultants. Name brands such as: Beaulieu, Bliss, Camelot, Mohawk, Phenix, Shaw, Armstrong, Congoleum, Mannington, Bruce Hardwoods, Quick Step, Florida Tile, Happy Floors, and many more! Because we have the experience you can trust as our staff collectively offers over 50 years of real-world flooring experience. Our staff has the knowledge not often found in the national chain stores. Visit Ron Bailey, Rob Dashewich, Scott Bailey and the expert staff at Carpet Consultants Flooring today! We can help you find the right flooring for your home at the right price for your budget! 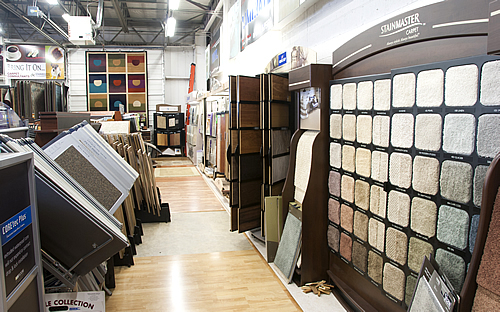 We have hundreds of displays and carpets in stock! Can't find the color you're looking for? Pretty good chance that we have it. Hard to find tile sample? Stop by and see our collection. if we don't have it chances are we can get it for you. Stop by today! © Design by Daytons Web Guru. All Rights Reserved.